At a casino with ten mobile games in total, a new game doesn't come by often. Yet, when it does, yo know it's a really good one well worth a spot in the very limited games collection. So, as soon as we caught wind of the new title at PocketWin Casino called Sinbad: Slots of Gold, we knew it was going to be good. Based on the story of the sea-faring hero of the Middle East, there's plenty of ship, sea and tentacles in this mobile slot. Not your usual sun and sand type of fun. Let's review Sinbad: Slots of Gold and see what sort of wins you can expect. All of the games at PocketWin Casino are developed by InTouch Gaming, a moderately sized software development company that's known for great graphics, engaging mini-games and simple gameplay. But don't be fooled by the easiness of the game, the smallness of the games portfolio at PocketWin or the lack of all kinds of bells and whistles that major casinos offer. Playing Sinbad: Slots of Gold at PocketWin casino could be the best thing you do today, this week and potentially this year. That is if you are on the look-out for your next favourite mobile slot that's low variance and can provide you with many hours of spinning madness. And don't forget that if you aren't a registered member yet, you can claim the free £5 at PocketWin Casino, no deposit necessary, win and cash out up to £50. Very generous! It's been a while since we've seen a new game come out at PocketWin so Sinbad: Slots of Gold has taken us a little bit by surprise. It's an unusual theme that hasn't been seen in the gambling world often and sits a little bit funny in the portfolio of PocketWin itself, alongside a medieval themed slot, a cartoon mouse themed one, a spy game, a fruity and a handful of table games too. In any case, we've got to say that the game plays beautifully and looks gorg on the screen of our iPhone 5s. Yes, the graphics must've been taken down a notch in terms of HD quality and the lightning strikes around the symbols look a bit amateur 90s to us, but overall the game gives you the experience of steering a ship through stormy seas. The game characters are engaging and Sinbad himself fights off the giant green tentacles poking out from the water every now and again. Instead of clicking on a Spin button, you'll be spinning a ship wheel and the realistic waves can really draw you in. All in all, not a bad experience theme and audiovisual wise. But let's go back to the main guy – Sinbad. More precisely, Sinbad is a sailor who fared the seas in search of adventure, terrible beasts, magical places and, of course, loot. 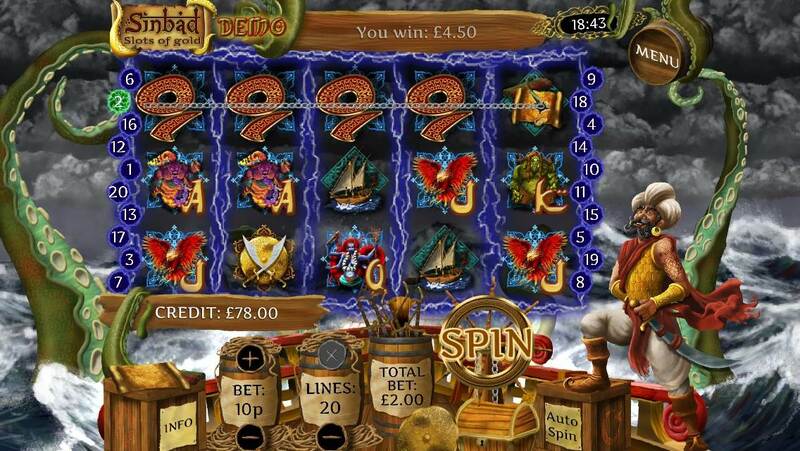 And loot is what you're going to get if you stick around on Sinbad: Slots of Gold. As it is a low variance slot, there will be smallish wins that come at you pretty often and things keep going and interesting. 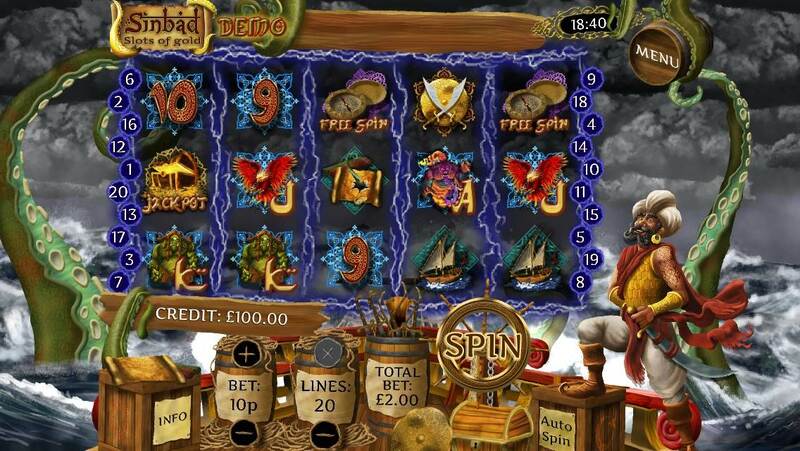 The five reels and the twenty paylines is the basic set-up of this slot. You can bet as little as 2p – you'd be playing just one payline then and the chances of winning are pretty slim, but with the two mini-games, you could be playing for a while even with a limited budget. That said, this isn't the slot to play if you expect absolutely massive wins although the maximum payout is £33,000 if you're playing at the maximum bet of £60 a pop. We found that the regular gameplay did keep us pretty level when it came to staying at our starting budget. And that's a surprise given the roughness of the sea in the background and the willingness of ours to keep upping the bid. The better part of the deal were the mini-games where multipliers are given out left and right, so jump straight to our Features section below to find out more! As usual, the Wilds substitute for every other symbol except the symbols that trigger the mini-games, more on which below, and the Scatter symbols which will get you some Extra Spins. Oh and although you cannot have Wilds in any combination with Jackpot symbols to score the actual jackpot, if you do manage to get a combo, then you'll be awarded 300x multiplier instead. 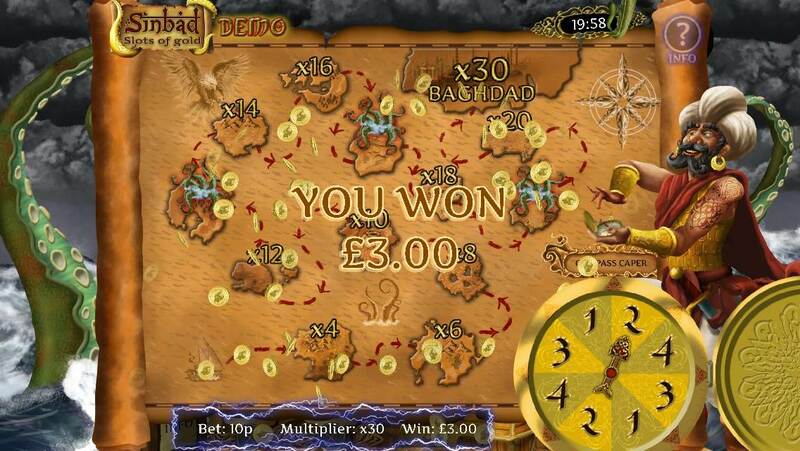 Another straight-forward feature in Sinbad: Slots of Gold are the Extra Spins. Three, four or five Scatter symbols will award five, seven and nine Extra Spins accordingly. They will also award multipliers based on the number of Extra Spins symbols on your reels: three will get you a nice 10x, four will get you a super-nice 30x and five will get you an unbelievably generous 100x! You might wonder – what do spinning wheels and gameboards have anything to do with this game? Well, that's just us using simplistic names for the fancy names they developers have given their two mini-games. As has become quite common in such low variance slots at mobile casinos like PocketWin and mFortune, the mini bonus feature rounds aren't you big, elaborate features anymore. More likely, they are just a distraction to get you away from the main game and think that you're getting more bang and entertainment for your buck. In any case, the first of the games is Sea No Evil, creatively titled but not so creatively executed. Quite simply, it's a wheel of fortune of sorts, wielded by Sinbad's lady friend. Depending on how many of the Ship symbols you enter the game with – two, three, four or five. Accordingly, you're awarded 1, 2, 3 or 4 goes at spinning the wheel. And it will be spun once you've selected which multiplier you want to do for: 20x, 30x, 40x, 50x, 60x or 70x. The WIN and LOSE segments on the wheel change proportions, with a higher chance of losing for the bigger multipliers. You get the point… The nice and somewhat surprising thing is that even if you lose, the minimum win is 10x if you enter the game with 2 symbols, 15x for 3, 20x for 4 and 30x for 5. Sweet! We don't know about you, but we couldn't find any information on the progressive jackpot, except for the fact that there is one. Or there is supposed to be one… In any case, you can get to it if you collect five Golden Treasure Chest symbols on your reels, while four of those will get you a 200x multiplier. Not too bad. We'd love to know as to how large PocketWin casino launch their progressives and how fast they accumulate into a substantial sum worth chasing after, but we don't have our hopes up that high. Given the fact that it's a smallish casino with a teeny tiny games portfolio, you'll be lucky if it's a couple of grand. Still, nice to have. Want to play Sinbad: Slots of Gold? Sinbad: Slots of Gold is the newest PocketWin mobile slot with outstanding feature games! Sinbad: Slots of Gold Perhaps you know Sinbad from the Disney movie or the popular video game, but Sinbad: Slots of Gold has righteously deserved a spot in our minds as THE game to play at PocketWin casino. Maybe it's because we don't care much for the other themes such as spies or cowboys and Indians, but not because those are bad games, but simply because of personal preference. In any case, Sinbad: Slots of Gold has got all what it takes to captivate audiences and keep them coming back for more. First, low variance means you can stretch your budget quite far and get long hours of entertainment from a humble fiver (N.B. don't forget the free £5 new players get at PocketWin). Second, the theme is unlike any other that's been launched recently and the game graphics are awesome - you'll think you're in the middle of the ocean, when in fact you could be in your own...loo. Last, the features and the progressive jackpot are just too enticing to miss! So why don't you head out on the high seas in search of your treasure? Four out of five stars. Jurassic Park Mobile Slot Review – Blockbuster Entertainment!